Not to be confused with Star Valley, Arizona or Valley of the Sun. 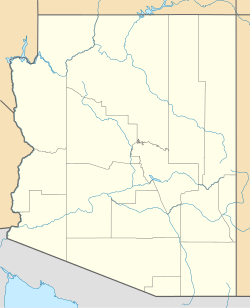 Location of Sun Valley in Navajo County, Arizona. Sun Valley is a populated place east of Holbrook, Arizona along Interstate 40. It is located at 34°58′50.09″N 110°3′29.43″W﻿ / ﻿34.9805806°N 110.0581750°W﻿ / 34.9805806; -110.0581750 in the Painted Desert and covers an area of 31.56 square miles. Sun Valley has always been a sleepy community along the old western highway of Old Route 66 and the newer Interstate 40. Not much is known about the settlement and how its roots began as a community, but it has and still remains largely rural and sparsely populated. Cattle Ranching has been one of the largest agricultural activity in the area. There are still some large tracts or ranch land around Sun Valley and cattle roam the open range of the landscape. As of the census of 2010, there were 316 people, 88 households, and 56 families residing in Sun Valley. This page was last edited on 9 November 2018, at 20:16 (UTC).